Never Tried a Peel Before? This One's for You! I’ve actually never gotten a peel before (true story! 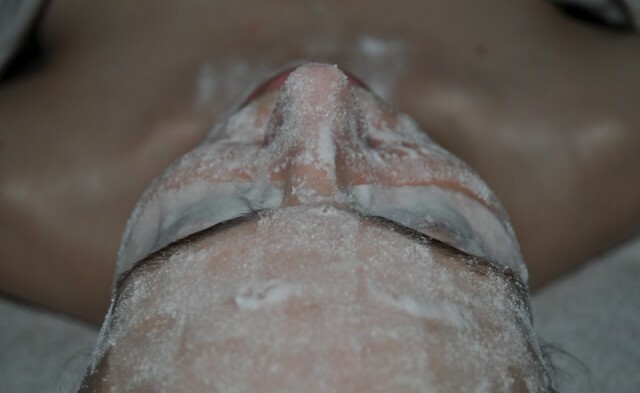 ), so I was excited to try an all-natural, intro-level peel that is specifically designed for skincare procedure newbies. 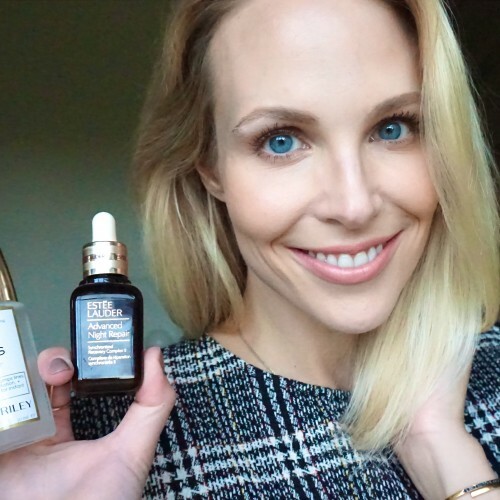 I definitely noticed a visible difference in my skin the next day– more even-toned, more glowing, and softer than before. Here’s my review of the Cosmedix Benefit Peel, a therapeutic resurfacing peel that uses vitamin C to resurface skin while neutralizing irritation. 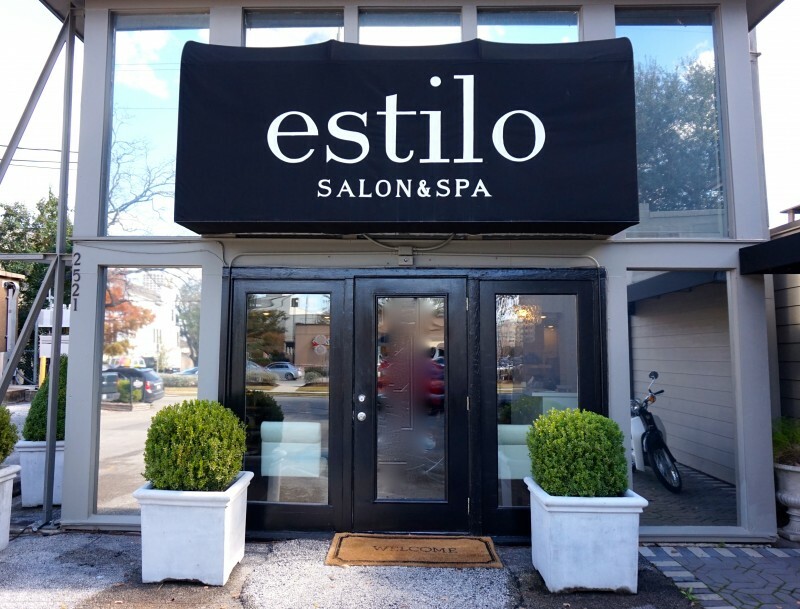 Estilo is a high-ceilinged, light-filled salon off Westheimer, in between Montrose & River Oaks. Fun fact: Mario, the owner of Estilo, did my hair for my wedding day! His balayage and styling skills are amazing!!! Now, on to the facial: I arrived at Estilo wearing my trusty It Cosmetics CC Cream Illumination (can’t leave home without it! 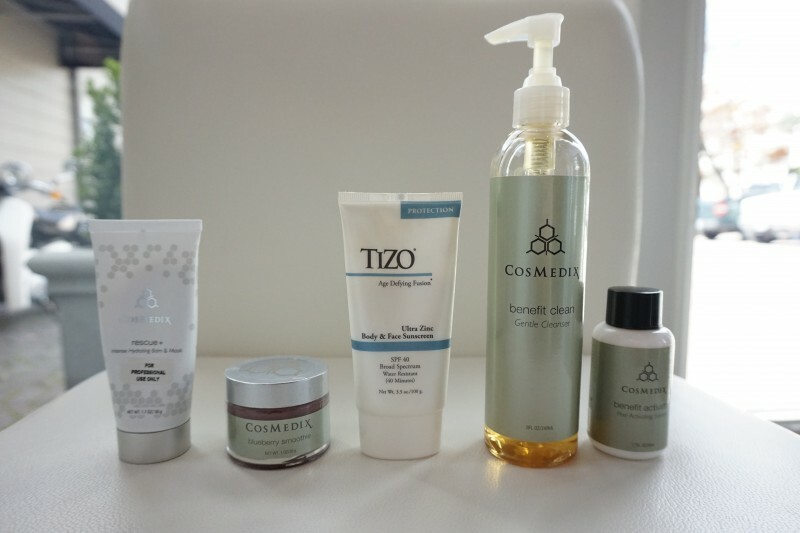 ), so Vanessa first removed my makeup with Cosmedix Benefit Clean Gentle Cleanser. Then she followed up with Purity Clean, an exfoliating cleanser with Lactic Acid for brightening. 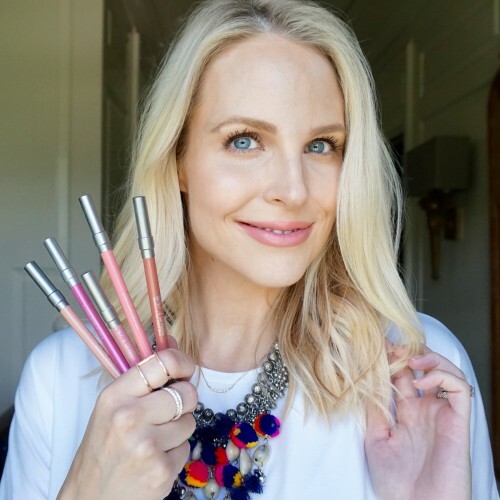 I’m totally with Vanessa on the double-cleanse– since I started using Bioderma Crealine H20 to remove my makeup BEFORE I use my normal cleanser, I’ve had noticeably fewer breakouts. Apparently using just one cleanser alone (which I had done for….my whole life) was not sufficiently removing my makeup. 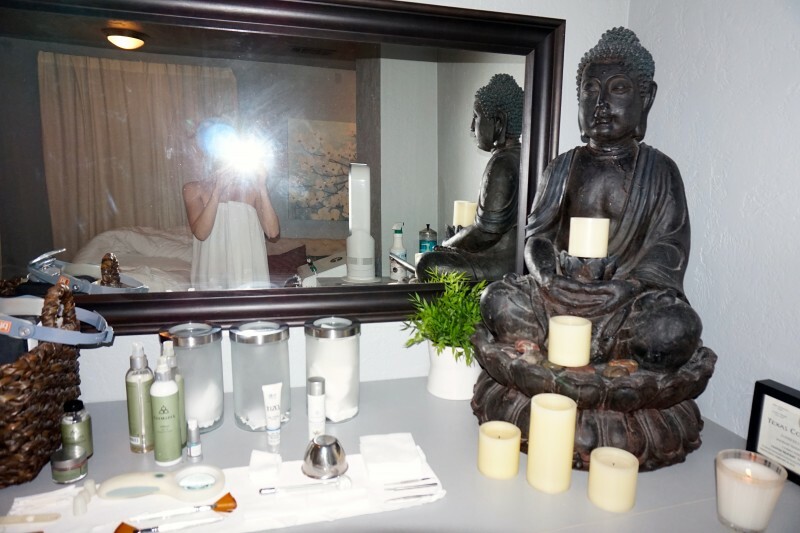 Inside one of the upstairs spa treatment rooms, feeling very Zen in my spiffy towel-wrap. Next Vanessa applied the divine-smelling Blueberry Smoothie exfoliating scrub. Part lactic acid exfoliant, part manual scrub, this treatment exfoliates to clear blemishes and reveal more youthful, glowing skin without irritating or drying. It smelled just like a mimosa as she was putting it on my face, and it was not overly gritty or uncomfortable. And I love that it has real blueberries in it! While the Blueberry Smoothie was sitting on my face, Vanessa brought over the steamer to open up my pores, and gave me an amazing neck and shoulder rub. Ahhhhh! Then she did a few extractions of blackheads on my nose and chin, all the while telling me my skin looked fantastic (which is always nice to hear). Finally it was time for the Benefit Peel! It combines 10% vitamin A with powerful antioxidants like vitamin C to neutralize irritation while it resurfaces your skin to reveal more radiant, even-toned skin. Interestingly, she asked me if I had anything important that afternoon (nope) because the Benefit Peel works best if I can “marinate” in it awhile. I like the sound of that! So after she patted in the peel and let it absorb into my skin, she let me leave with the peel still on. In fact as I write this, the peel is still sitting on my face and I’m about to pick up my kids. I’m not afraid to mask in public. If you look closely, you can see little pieces of fruit and grit stuck on my face– this is the peel “marinating.” Now, off to carpool! Before I left, Vanessa patted some chemical-free sunscreen on top of the “marinating” Benefit Peel to protect all that new baby skin from the sun’s harsh rays. She swears by the Tizo sunscreen, which, as Vanessa reports, Kylie Jenner uses. Not that I care about that kind of thing. Yet why do I suddenly want said sunscreen???? Oh, Kylie, you marketing wizard, you. Vanessa also introduced me to a product that completely blew my mind– Cosmedix Rescue Balm. 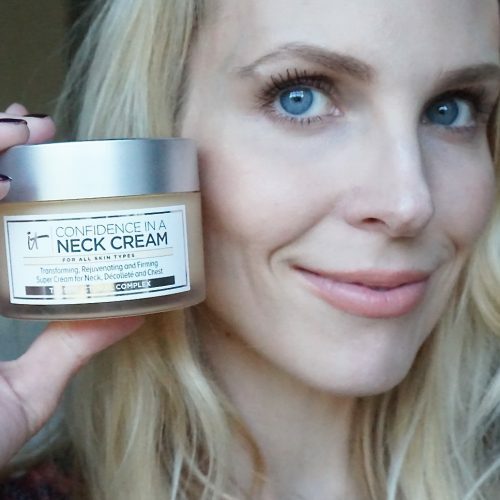 It’s a moisturizing balm that is a different consistency than anything else I’ve tried– and it is reasonably priced! First she dabbed it on my lips and it felt amaaaaaazingly moisturizing, unlike any other lip balm I’ve tried. Then she dabbed it around my eyes like an eye cream, and I was like, wait, is that the same thing as on my lips? YASS. If you are into all-natural skincare and need a heavy-duty moisturizer (it doubles as a moisturizing mask also)– the Cosmedix Rescue Balm might just be your jam. UPDATE: I just slept in a thick mask-like coat of Cosmedix Rescue Balm last night and it was AWESOME!!!! Did not break me out like other overnight masks, and my face felt like a baby’s bottom in the morning. What about the results of the Benefit Peel, you say? #skinonfleek!!!! 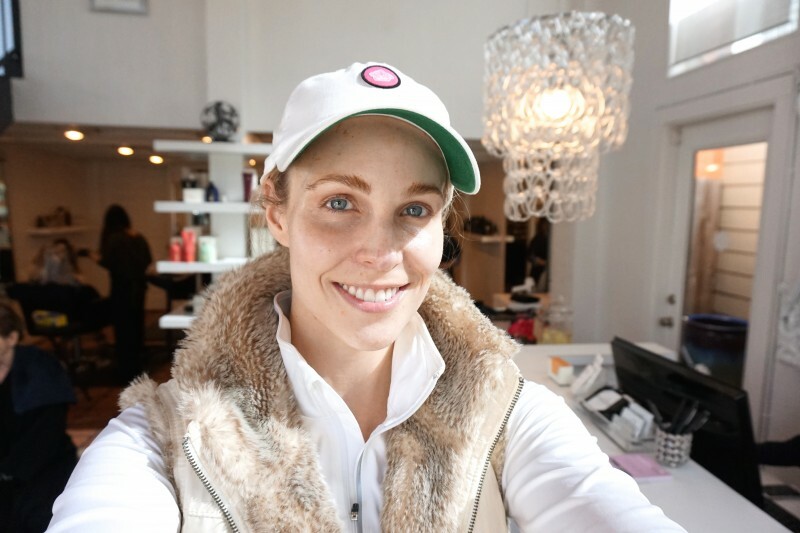 Here I am the day after my Benefit Peel– I felt like my skin looked incredible! I’m also sporting an awesome blowout by Destiny at Estilo. 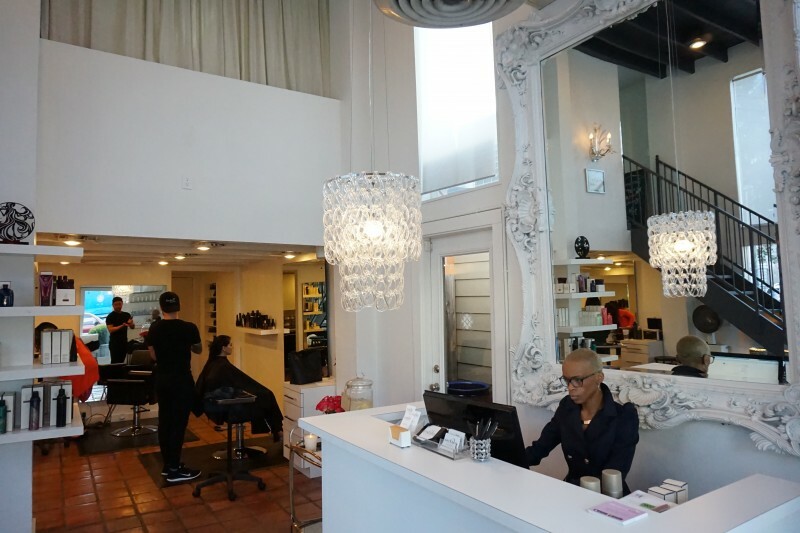 Estilo Salon & Spa is truly a one-stop beauty shop, all bookable in seconds on BeautyNow! No retouching in this photo, I swear! 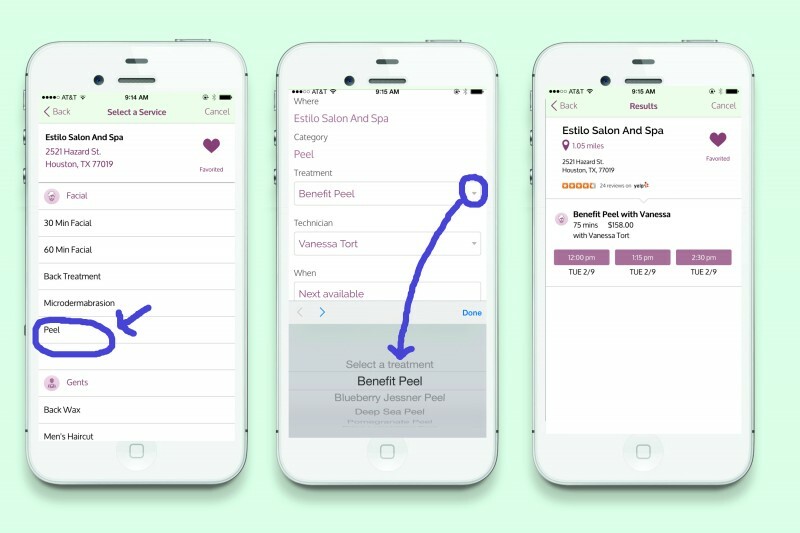 I booked my Benefit Peel on the BeautyNow app with the lovely Vanessa at Estilo Salon & Spa– it was super easy to instantly book my procedure with just a few taps! 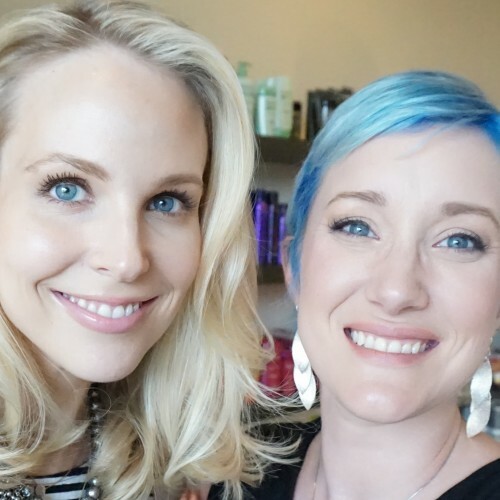 Use the BeautyNow app to book your Benefit Treatment at Estilo and get $25 off your treatment! (Discount taken at checkout after your treatment). Or click here to browse a list of spas around the U.S. who perform the Cosmedix Benefit Peel.